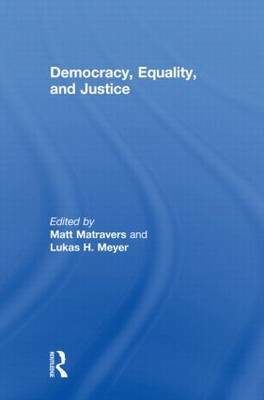 In addressing democracy, equality, and justice together, the book stimulates discussions that go beyond the sometimes increasingly technical and increasingly discrete literatures that now dominate the study of each concept. The chapters fall into four categories: on justice and democracy; justice and equality; justice and community; and justice and the future. Concerns of justice unite all the chapters in this volume. However, these concerns now manifest themselves in interesting and new directions. Politically, the book confronts urgent problems of democracy, equality, community, and of how to respond to potentially catastrophic climate change. The response to these problems cannot only be pragmatic and piecemeal. What emerges are a number of interlinking questions and themes that together constitute the central core of contemporary political philosophy. This book was previously published as a special issue of the Critical Review of Social and Political Philosophy.